Jerusalem, Israel — September 17, 2018 … Israel is one Jewish nation. But it does consist of several vibrant communities within. We have the Russian, the Ethiopian, the Iraqi, Yemen, German, American, secular and ultra orthodox religious. Unlike the native born Israeli – the Sabra – Americans who move or make “Aliyah” to Israel are a very strong, creative and independent breed. They have walked away from an easy life in the US where having a disposal income is the norm. Most have not grown up in Israel having entered grade school with fellow Israelis who are able to provide a natural support system for them. That’s called Protexia or “protection”. Ari Fuld was an American Israeli. He was one of our finest. He served in an IDF combat unit – an elite member of the Paratroopers. He was an observant Jew who studied and taught Torah. He believed in self defense, secured a Karate black belt and taught young children to defend themselves. Ari advocated for the Israeli soldier – doing all he could to make their life of a higher quality while serving. He was a loving husband and father of four young children. This New York born native, died as he lived – defending Israel. Ari was not in uniform. Rather he was just taking care of every day chores preparing for Yom Kippur as he stood outside the shopping mall in Efrat. An Islamic terrorist approached him from the back. If this terrorist had the nerve to openly confront Ari, it would have been the terrorist that was buried. Rather, as the weak coward that he is, the Arab terrorist stabbed Ari several times in the back and attempted to run off. In pain and weakened, Ari turned around and gave chase, jumping over obstacles as he reached for his gun. He took a classic shooting stance and got off a few rounds – enough lead to stop the terrorist from taking more lives. 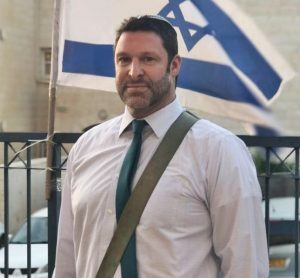 Ari Fuld knew the meaning of being a victim and was not going to become one. American Israelis move to Israel for several reasons. But perhaps the most noted is that we will not allow another Holocaust to manifest itself anywhere in the world. We will no longer allow any person and or organization to turn us into a victim. American Israelis know they are taking a risk living on the front line of democracy in the Middle East. They face Islamic Holy War – Jihad – on a daily basis. Confronting rockets from Hezbollah in Lebanon, terror tunnels dug by Hamas in Gaza and knives in Jerusalem. Whether in uniform or in jeans, American-Israelis will not run from it. Josh Hasten, who said he had known Fuld for about a decade, said his friend traveled widely to showcase “the beauty and reality of life” in the country. “He lived a hero and died a hero,” said Fuld’s brother, Hillel Fuld. Ari Fuld’s bullets were not aimed at one Arab, Islamic terrorist. They were targeted at every human being who embraces genocide, anti-semitism and hate. Now it is the job of the Israeli police, the IDF and Israel’s INTEL community to avenge this murder. It is the responsibility of the US government as well to address incitement and violence in Israel- as Ari was a proud American citizen. Closing the offices of the PLO in Washington was a good start. As a family, we feel the tremendous hug and embrace from an entire nation and its leaders. And everyone agrees unanimously, Ari was a real life super hero. Bibi pleaded with us to put the incredible tails that are coming from all corners of the earth into a book. In seeking an effective, immediate response, the Israeli government should transcend demolishing the family house of an Islamic, Arab terrorist. Rather – they should go for the head of the snake – demolish the house of Iran, a government which feeds this hate, violence and Jihad on a daily basis. Whether though assassination or the use of F-16’s – we will see a response. In doing so, we need to thank the Israeli security services … and every American living in and out of Israel that supports an undivided Jerusalem as our ancient, biblical, historical, religious, legal and cultural home.